HOWE (October 18, 2016) – Ten years after moving to higher education, Dr. Mark Jones has found himself back in a high school classroom – except he’s not in the classroom. He’s 140 miles away. High-tech teaching methods are enabling juniors and seniors at Howe High School to take Jones’ chemistry class, a blended learning environment designed with cutting-edge tools he trains his pre-service teachers to use. 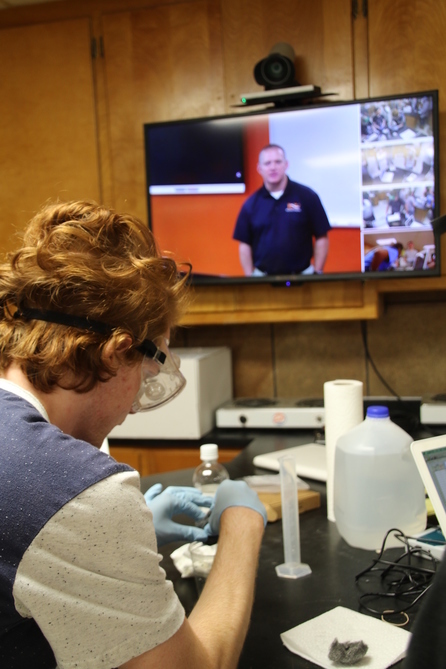 Videoconferencing equipment is connecting Jones, at East Central University in Ada, to a converted old home economics classroom in Howe, a rural district 20 minutes from the Arkansas border. Howe Public Schools reached out to Jones about developing the class after the district could not find an instructor in the area qualified to teach chemistry. Vacancies in higher-level science are widespread. It is one of the subject areas hardest hit by the teacher shortage affecting Oklahoma. Of the nearly 1,000 emergency teacher subject area certifications requested in the state in the last three months, 17 percent have been in science. Even though Jones isn’t physically in the classroom, he can monitor his students up close. Each of the five lab stations in the chemistry classroom is equipped with a videoconferencing unit that allows him to toggle back and forth to each station, so he can monitor each group’s progress. Via dual connectivity, Jones can talk to the students one-on-one or as a class about why a chemical reaction is happening. An assistant professor of educational technology at ECU, he saw the Howe position as a chance to put enhanced teaching skills into practice as well as a way to further train new teachers. Jones assigns the students work on Google Classroom, an online platform that allows them to work on their assignments in the cloud. By using assignment templates, Jones can access students’ documents as they are developing them to give real-time guidance and feedback. The high school students use distance-learning lab kits from Carolina Biological Supply Company. The kits require small amounts of low-concentration chemicals to reduce safety risks, as well as LabQuest sensors and digital probes to upload data collection to software that Jones can view instantly. The textbook is virtual, too. Students use open educational resource materials from the CK-12 Foundation that they can download or read online. They have access to Jones’ presentation via Pear Deck, a live slide session shared on Chromebooks. Pear Deck also lets students respond to poll questions on their laptops, allowing Jones to check for comprehension and share their ideas within his presentations. “Basically everything we do, we had access to it all the time because it’s all online,” said Joseph Swarts, who took Jones’s class last year as a senior. The class was harder than his regular classes at Howe, he said, but it helped prepare him for college-level classes. “It’s a good preparation class. Sometimes if we were struggling and we needed him to go further into details of what he was talking about, he’d use his board to show us, and we’d work through it together,” Swarts said. In the blended course, students are expected to study material independently. Instead of lecture format, live sessions are primarily knowledge checking, discussion of misconceptions and clarification, and hands-on lab experiments. For a recent project, students collaborated as a team to create a video explaining the physical properties of matter using WeVideo, a web-based video editor. “If you don’t pay attention in class, you’ll miss things that are really important, but I’ve learned so much. I learned something new in class every day,” said student Taya Kellogg. The Howe students don’t have to rely on a virtual teacher alone. The district staffs the classroom with a teacher to assist, prepare lab experiments and trouble-shoot. In addition to teaching his students, Jones has become a mentor to his co-teachers. Dustin Long was an experienced math teacher at Howe interested in broadening his subject area to include science; however, he had not yet met all the certification requirements to teach science. He was granted an emergency certification and paired with Jones last year as the co-teacher in the classroom. Working closely with Jones, Long gained more confidence in the subject and was able to model some of the professor’s practices in his other classes. Distance learning is nothing new for Howe. The district has shared a Spanish teacher with other districts in the past but had to switch to online coursework when it could no longer find a teacher to hire. Howe currently offers a catalog of 173 online courses in 20 subjects to its students through individual study, including classes in six foreign languages plus sign language. Scott Parks, superintendent of Howe Public Schools, said investing in technology and online classes is a costly endeavor but is essential to preparing his students for college and beyond. Parks said because of the financial squeeze in public education, his district has had to make sacrifices to keep technological tools like the dual connectivity set-up in the chemistry classroom a priority. Cracked sidewalks and gravel roads may line the Howe campus, but inside its steel buildings, even the youngest students enjoy a 1:1 ratio of students to iPads or computers. Howe spends about $40,000 a year on online coursework. To stay current on equipment, it seeks out supplemental technology funding through grants and business partnerships. But Parks said technology itself is not Howe’s goal. Back in Ada, Jones is thankful for the opportunity to reach high school students again. As he’s waiting for them to take their seats before the bell rings, Jones congratulates one on her accomplishments at the state track meet. He later explains that simple acknowledgments like these are an important part of managing the long-distance dynamic. “I try to eliminate the distance as much as possible,” Jones said. “We make sure we spend time visiting with them on a personal level, and there is a real connection with the students. I’m not a recorded video that you might see with some kind of canned curriculum. PHOTO: Joseph Swarts works on a lab experiment with the help of his chemistry teacher Mark Jones via video conferencing. Howe Public Schools hired Jones, an assistant professor at East Central University in Ada, when it could not find a qualified chemistry teacher and converted the class into a blended distance-learning course.